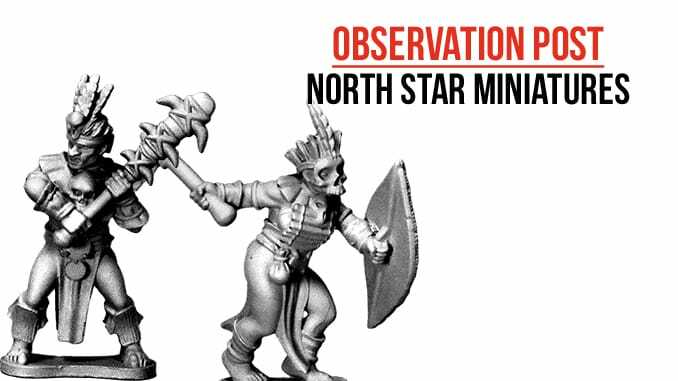 North Star Miniatures have added some characterful metal miniatures to their Frostgrave: Ghost Archipelago range. The new miniatures are the chiefs and shamen who lead their Tribal brethren throughout the myriad islands which make up the Ghost Archipelago. Once you’ve used the plastic Tribals boxed set to make your basic troops, these metal Specialists are designed to enhance your force or just to act as the leaders that every tribe needs. All of these figures will be available in packs of two or as single figures. The figures shown here are the Mercenary with a vicious looking double handed club, the dancing Warden in terrifying mask, the Freebooter with skull mask and the Tomb Robber with his stone axe. These are just some of the figures which are upcoming as a part of the Ghost Archipelago: Gods of Fire Nickstarter pre-order system and will no doubt be out for retail fairly soon. Each is an excellent addition to the range which complements the plastics already released.